Trailhead and parking area are located on Hogan Road in Gorham, NH. To get to Hogan Road, take North Road across the Androscoggin River from Rt. 2, 3.4 miles east of the eastern junction with Rt. 16 in the center of Gorham. On the other side, turn left onto Hogan Road. Quickly pass the trailhead for Centennial Trail. As stated in the description above, the most convenient way to hike to the view ledge Mt. Hayes is also very inconvenient to access by road. Centennial Trail offers a longer hike that avoids Hogan Road. See above. Continue 4.5 miles down Hogan Road, driving all the way back to Gorham on the opposite side of the river. The road stays very close to the river at all times; bear left at all forks. Be alert for flooding and protruding rocks and drive slowly. Park on the right side of the road next to the Gorham Hydro Station. Mt. Hayes is the westernmost peak in the Mahoosuc Range. It stands guard over Gorham, bounded by the Androscoggin River on two sides. A short but sprawling mass, Hayes features several cliff-fronted knobs on its southern slopes. 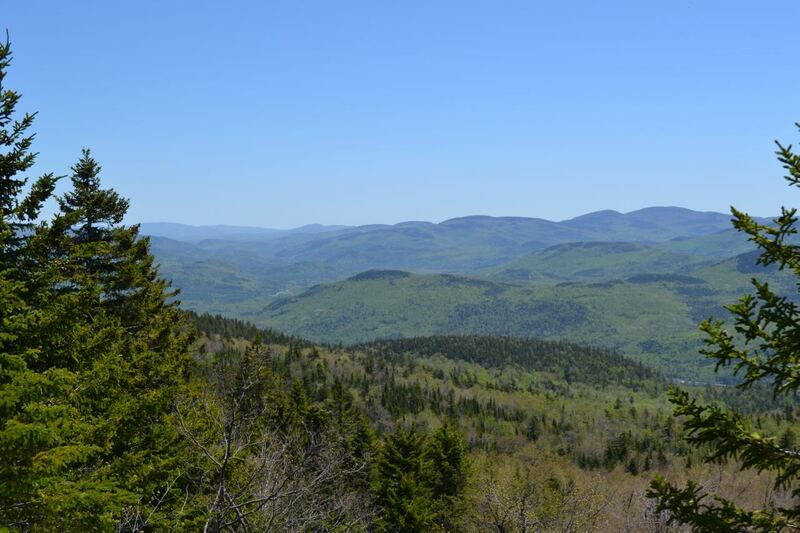 Its main viewpoint is a ledge to the south side of the summit which offers a fine vista overlooking Gorham and the northern side of Pinkham Notch. The trail approach described here requires a 4.5-mile drive down a very rough dirt road, which is prone to flooding and may be unsuitable for low-clearance vehicles. If you don't think you can make it down this road or would just rather avoid such an annoyance, the Centennial Trail, at the beginning of the road, offers an alternate option. The approach via this trail is 7.2 miles, which is 2.2 miles longer than the Mahoosuc Trail approach. From the parking area at the Gorham Hydro Station, continue up the road on foot for 0.1 miles to the trailhead sign and turn right onto the Mahoosuc Trail, which leads 0.2 miles through the forest, then crosses a power line cut. It quickly joins an unnamed brook, which it follows closely for a short distance, passing a small cascade. Half a mile from the road, a spur turns right off the main trail and leads 0.2 miles to Mascot Pond, a lovely pond with mountain views across the water. Behind Mascot Pond is a dramatic gravel slide which drops from the cliffs of Leadmine Ledge. Back on the Mahoosuc Trail, continue the gradual ascent through wonderfully open woods, crossing a grassy old road a half mile from the pond spur. The trail begins to climb more steeply, following a prominent drainage most of the way up with one small brook crossing near the beginning. The ascent is mostly straight up-slope, with few switchbacks. Some birch stands are passed along the way. The trail curves slowly to the northwest for the first 0.7 miles, then turns to the right and climbs more steeply through coniferous woods for the final 0.3 miles. The trail then levels off somewhat and a spur on the right leads out to a nice open ledge. This is 0.3 (trail) miles south of the summit and 0.5 miles south of the junction with Centennial Trail. This ledge viewpoint is notable for its excellent birds-eye view of Gorham and the Androscoggin River. It presents a fine view over the valley around the town, with a backdrop of the gigantic northern Presidentials. You can see a fair distance up the valley into the Pinkham Notch itself. Across from the towering Presidentials, you observe the lower Carter Range, which contrasts the stark gray sharpness of the high peaks with its more green, rolling nature. By moving further along the ledge, you can see to the east, where you may spot Speckled Mountain.